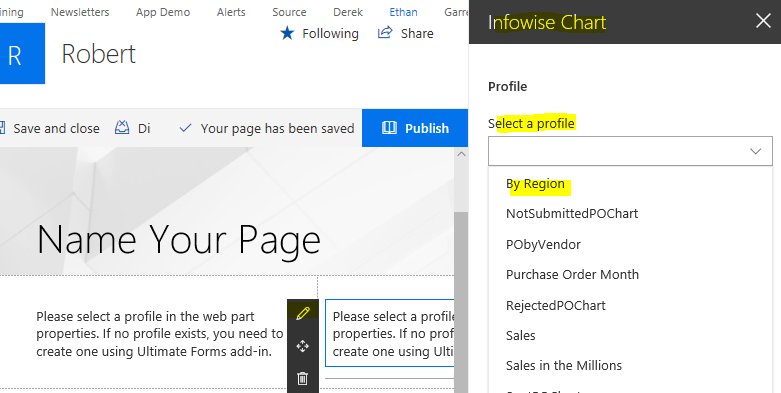 Infowise allows us to create over thirty different types of real-time charts in SharePoint. By combining Smart Chart Pro with Smart Filter, we can make live and filterable charts that allow us to easily drill into our data! First and foremost, we need to build a list of data that we want to report on. In this example, we will be using a Sales list with Product Name, Month, Year, Amount, Region and Product Category as columns. 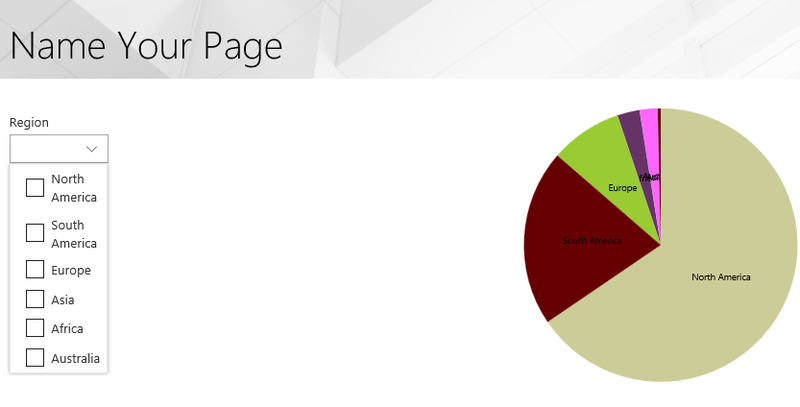 In this example, we will be building a real time and filterable chart based off the Region column of the sales list. Possible values include: North America; South America; Europe; Asia; Africa; Australia. In the ‘Series’ section, select ‘Amount’ from the left-hand dropdown and ‘Sum’ on the next. Then click add to add this series to your chart profile. Go ahead leave the chart settings as their default pie chart settings since the goal here is to demonstrate connecting the chart to the filtering ability. Next, we will want to set up our Infowise Filter Profile. 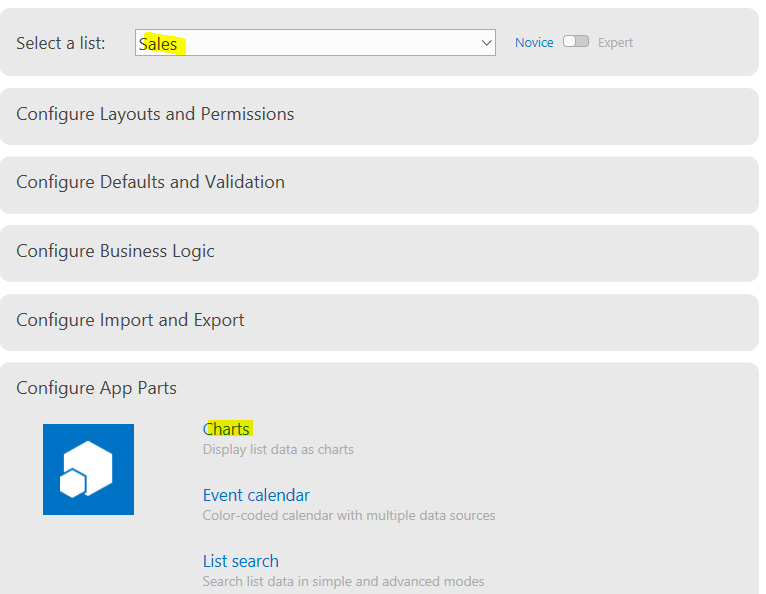 Navigate back to your Infowise Design Screen and select ‘Filters’ from the ‘Configure App Parts’ section. 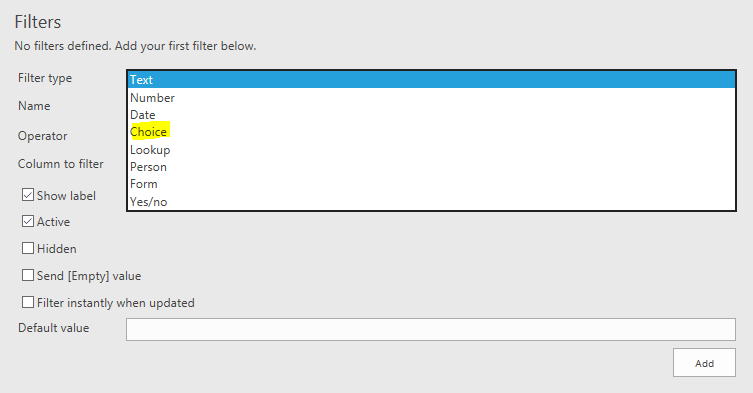 Once in the Filter screen, give your new Filter the name of Sales and uncheck the ‘Show Filter button’ checkbox. Give your filter the same name as your column, in this case ‘Region’. Leave the operator as equals and the ‘Same name as filter’ button selected. 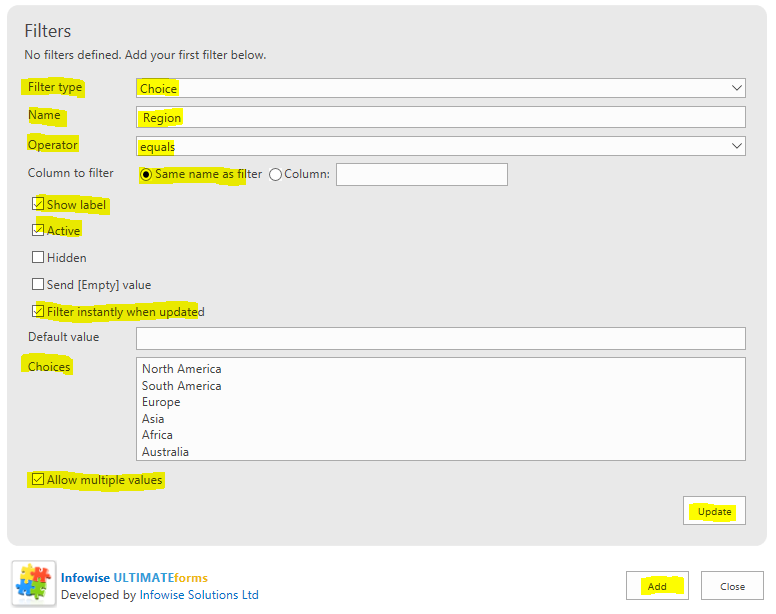 Ensure that the ‘Show label’, ‘Active’, ‘Filter instantly when updated’ and ‘Allow multiple values’ checkboxes are all selected. Once done, click ‘Update’ to add the Filter to the Profile and click ‘Add’ to save your new ‘Sales’ Profile. You should see your new profile in the ‘Profile’ section at the top of your page. 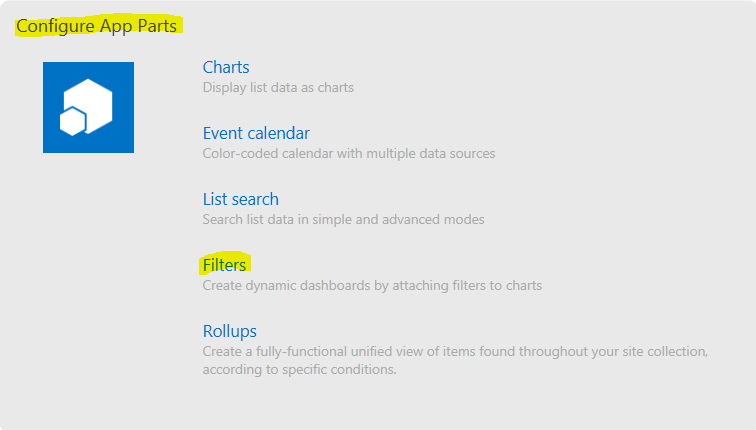 Now we are ready to create our Modern UI page for our Filter and Chart to sit on. Navigate to your Site Contents and select the ‘New’ button. Select ‘Page’ from the dropdown. You can create a ton of interactive charts to drill down into your data. By combining the Infowise Filter and Infowise Smart Chart Pro we can make real time, data driven charts that let us drill down and understand what is driving our business.